A top-down garment. This has a sweater top, and then transforms into a capelet, with a short side vent. 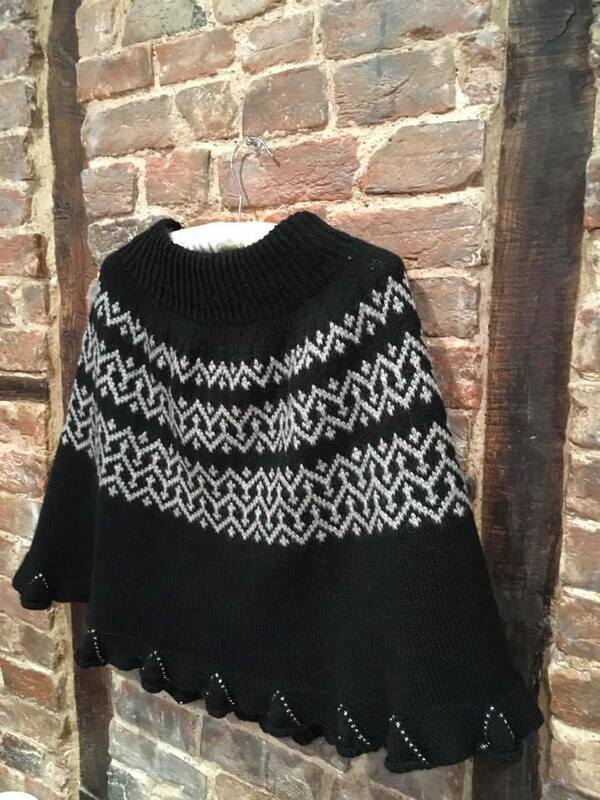 The top is Fairisle, with an easy chart, a folded Fairisle-lined collar and a ribbed neck. The hem-line is flared with beaded godets. This garment is knitted both in the round and flat. There are 2 sizes. Note: the 40 – 80cm long needles are chiefly used when working in the round; you may wish to transfer to longer needles if this is more comfortable for you as the stitch numbers increase. You may therefore wish to move to a 100cm needle for example. Pattern gives guidance, use needle length that feels best to you.